What Is Radiowave Mole Removal And How Does It Work? Everyone has moles. Big, small, round, or odd-shaped, these marks that dot the human body pop up in various places as people age. Most moles are harmless, while some can be a problem. Fortunately, there are ways to safely remove them, whether for cosmetic reasons or for a suspicious mole. Common methods include Excision, Laser Surgery, Electrosurgery, Cryotherapy, and Radiowave Surgery. There are risks and benefits to each of these, as well as differing results. 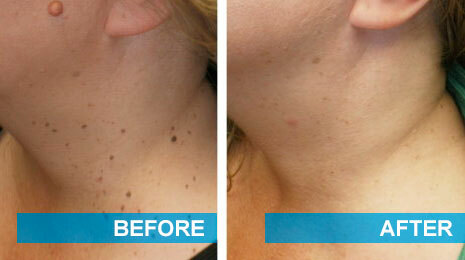 Radiowave mole removal has shown to be the method that leaves the least scar behind. A mole is a grouping of melanocytes in the skin. It can be raised or flat, and is usually round. Color varies and can be black, brown, blue-black, red, pink, or skin colored. The number of moles on the human body increases with age and sun exposure. Sometimes, a mole can be suspicious. These should be closely monitored as skin cancer begins with unusual-looking growths or moles on the body. Research has shown that regular mole self-checks increase the discovery of cancer in its earliest stages substantially. Skin Cancer is almost always curable in its early stages. Irregular borders – normal moles should be round or oval. Asymmetry – normally moles have the same amount of growth throughout. 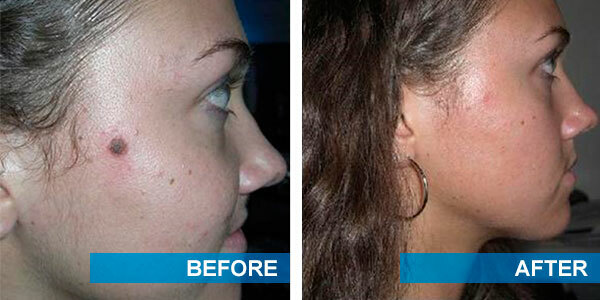 Ones that are asymmetrical will show different amounts of growth throughout the same mole. Color – moles that darken suddenly, are more than one color, or change color. Size – moles that keep growing, or are bigger than a pencil eraser. If your physician determines that your mole should be removed, there are several methods that may be chosen for the procedure. Excision is when a doctor cuts into your skin and the underlying tissue, then closes the site with stitches. One effective method that doesn’t involve cutting into the skin, uses radio waves to remove the mole. Radio Surgery (Radiowave surgery, or Radio Frequency Surgery), uses radio waves instead of a laser or electricity to remove a mole, skin tag or birthmark. High frequency radio waves are sent through a specialized wand and into the tip of the device. The type of tip can vary and include a hair-thin wire, a loop, or a blade, and are chosen based on the type and size of the growth. Choosing the right physician for mole removal is important. A Dermatologist is a doctor specializing in the skin, and is trained in different techniques to remove growths from the body. Make sure that your Dermatologist is board certified, is experienced, and is trained in the specific method of mole removal you choose. Plastic surgeons also can remove moles, and are frequently used to remove growths in delicate areas like the face. However, these doctors are not trained to recognize skin cancer or very suspicious growths like a Dermatologist is. Radio Surgery is not only used to remove moles. All kinds of skin growths including skin tags, birthmarks, and warts can be removed this way. Radio waves are also used on spider veins, tumors, neurosurgery, scar resurfacing, and plastic surgery. The gentle nature of Radio Surgery and shorter recovery time make it an excellent option for many different uses. Other methods of mole removal can be more invasive to the skin. Excision, for example, doesn’t only cut directly into the skin, it also takes tissue underneath the skin with it. This can leave a more noticeable mark or indent. Removal using electricity or lasers generate large amounts of heat, which may easily damage skin and can leave scars. Because Radio Surgery uses radio waves and not electricity, there is a minimal amount of heat generated, making the process more gentle. The device will not shock or burn you, either, as radio waves are harmless to the touch. Because of the minimum amount of tissue damage, the scar will be extremely light. For an average mole, there is usually no scarring at all. Your physician will numb the area surrounding the mole by injecting a local anesthetic into your skin. The Radiowave machine will send high amounts of radio waves through the wand and out of the tip, which is then lightly touched onto the mole tissue. The intense radio waves cause a process called intracellular volatilization, which causes water inside of the melanocytes to boil and steam, then rupture completely. Your physician will continue this process until all of the mole tissue has been cut away. The skin will start out bright pink, and a light scab will form over the area, which will then fall off, revealing new skin underneath. Removing moles through Radio Surgery leaves little to no scarring. Minimal damage: Because radio waves are harmless, they will not burn or electrocute the skin like lasers or electrosurgical procedures can. There are no incisions of any kind, keeping the skin intact. Little to no scarring: The mild nature of Radio Surgery uses less heat, which saves more skin tissue, thus producing minimal to no scar. Radio Surgery leaves the least amount of scarring out of any other procedure. Biopsies: Radio Surgery allows your physician to save a small amount of your mole tissue to be sent off for biopsy, if needed. This is extremely unique. For example, with Laser Surgery, it destroys all mole tissue, ruling out the procedure as an option for a suspicious mole removal. Radiowave treatment surgery, however, not only will remove a growth with minimal scarring, but allows some mole tissue to be gathered and sent off for testing. This is very important when dealing with any kind of growth your doctor wants a closer look at. Little to no bleeding: Because of the heat generated and the nature of the radio waves used, the blood vessels are cauterized (sealed instantly by heat) as the tissue is being cut away, resulting in minimal bleeding, if any. Shorter healing time: Radio waves are more gentle and cause less damage than other methods, resulting in a more rapid healing process. After mole removal using Radio Surgery, the area will be dark pink, and then a scab will form. In order to ensure that the least amount of scarring is left behind, proper wound care should be practiced. Do not scratch or pick at the scab, and make sure to keep the area as clean as possible to prevent infection. Cost for any mole removal will vary. Each doctor charges different amounts and insurance carriers may have you pay a certain portion. In general, mole removal costs anywhere from $100-$500 per mole, depending on size, method, and location. For example, a large, raised mole in a delicate area like your face many cost more than a small, flat mole on your back. Your out-of-pocket expense will depend on whether or not you have insurance, and what portion the insurance is willing to pay. Keep in mind, some insurance carriers will not pay for mole removal if it is done only for cosmetic reasons. Check with your insurance carrier to make sure that your physician is contracted with them, to ensure the least amount of out-of-pocket cost. When faced with the situation of mole removal, don’t forget to check out the many different options available. Discuss with your physician the use of Radio Surgery. Although not appropriate in some cases, such as the removal of a cancerous growth, it is an excellent option for the removal of a harmless or suspicious mole. If you want a quick procedure that leaves virtually no scar, it doesn’t get better than Radiowave mole removal.